Instagram announced plans to roll out an algorithm-based timeline back in March, and now it's officially here. The change is being made to help Instagram users find the most relevant content for them, according to the Facebook-owned service. "On average, people miss 70 percent of their feeds," writes Instagram in a blog post. The company hopes users will find more relevant content at the top of their feeds to engage with, instead of having to scroll endlessly through a chronological timeline. This move shouldn't be a surprise as it's exactly how Facebook's News Feed works. Unlike Twitter's new algorithm, which lets users toggle it on or off, there's no way to disable Instagram's (again, just like Facebook). That's a bummer for users who like getting a timeline view in their feed. However, you can still see a chronological view of an account when tapping on their name. Instagram now has over 400 million monthly users who are all posting an increasing number of photos and videos. It's understandable the service wants to help users separate the posts they'll find most interesting from the noise. For businesses who rely on Instagram for marketing, however, the new algorithm is a scary thing. If users don't engage with a post, then it becomes buried. 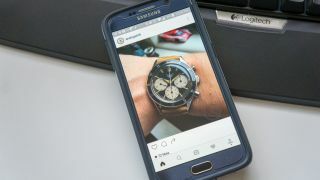 Instagram did release new business tools that provide useful analytics, an the tools also make it easy for businesses to turn a post into an ad. All of the big social networks have moved to an algorithm-based timeline. These changes are designed to keep you engaged with the social network and to find content that's valuable and interesting to you. In the case of Instagram, it's happening whether you like it or not.